Plants are the Strangest People: Anthurium no. 0575 "D'Arcy Drollinger"
It's not that there haven't been other red / pink or red / lavender blooms before, but they're uncommon, and the previous ones all have some problems.1 So if I have a fourth option, that's probably a good thing. And at least the thrips seem to be leaving D'Arcy more or less alone, so far. 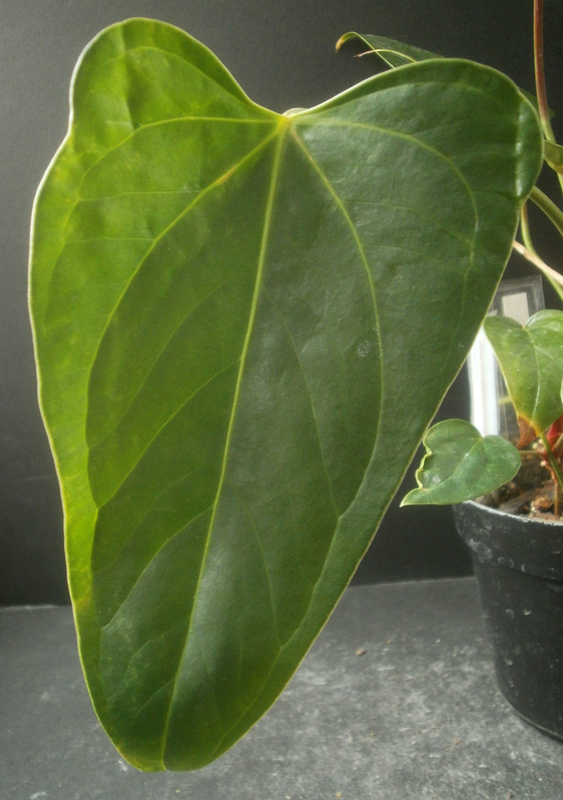 The leaves are fine, maybe slightly better than average. And the plant overall is floppy, and kind of a mess, though not to the point where I want to throw her out or anything. Haven't managed to pollinate D'Arcy yet, but there are some indications that she might be a pollen-shedder, and pollen is probably more valuable to me at this point than seeds are. So not the most exciting seedling I've got, but worth hanging on to. 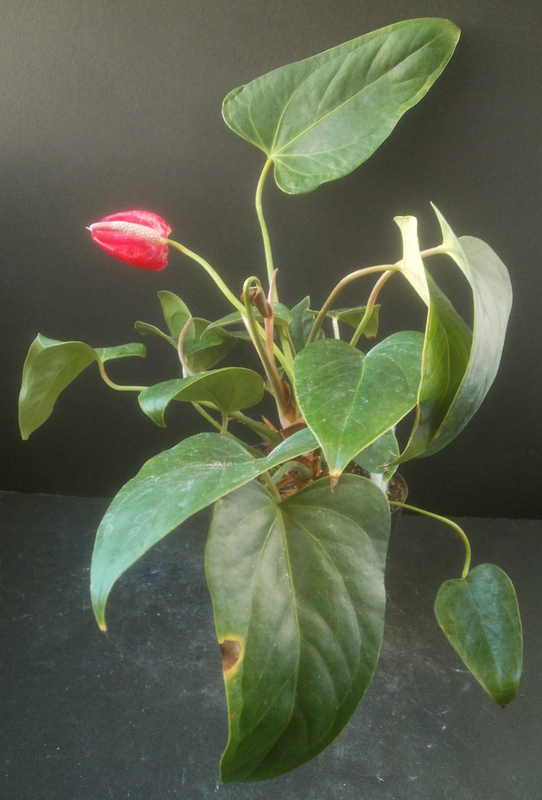 Meanwhile, first-time budding on the Anthuriums stopped very abruptly at about the end of September, which is kind of jarring, since I'd been seeing a new first bud about once every two or three days there for a while. A lot of the first-time buds that did appear have subsequently aborted -- sixteen of them! -- which was sort of disappointing, but also sort of a relief; most of them didn't look like they were going to be that special. Presumably most of them will try again soon. It's fine if the Anthuriums want to slow down for a while, though I'm not convinced that that's what they're doing. 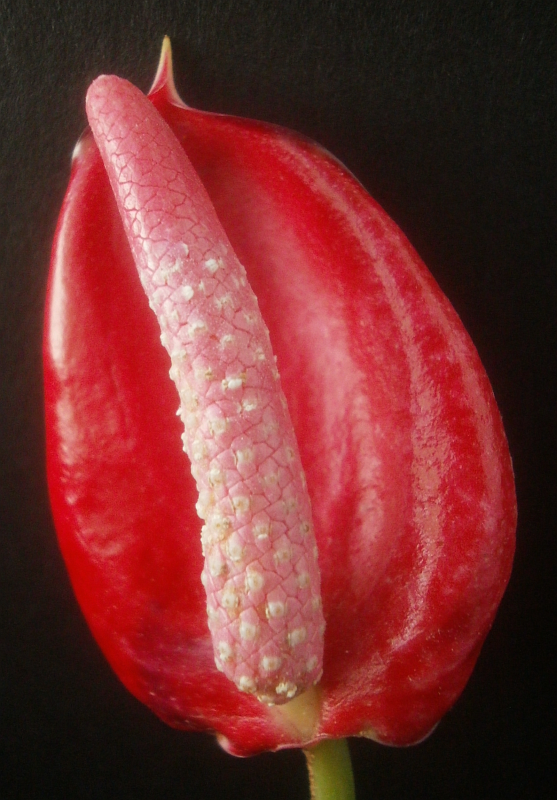 It will soon be time to roll out new first-time Schlumbergera blooms,6 and I can only write posts as fast as I can write them. 1 0144 "Graham Reaper" is a reluctant bloomer. 0213 "Nadya Falt" seems not to be doing well, but there's no obvious reason why. 0334 "Jean Poole" is both doing well and blooming her head off (plus the blooms last a really long time and are fairly thrips-resistant: Jean is amazing), but she's also enormous. Top to bottom: 0144 "Graham Reaper," 0213 "Nadya Falt," 0334 "Jean Poole"
• 0459 "Heather Marie Rose"
• 0499 "Libby T. Belle"
• 0537 "Bridgette of Madison County"
5 I also did this with 0115 "Erlene Adopter," who produced a bud in August, shortly after I mentioned her here, but she dropped the bud after getting promoted. All indications were that it was going to be another orange/orange, so I haven't really lost anything, but the space on the shelf probably should have gone to a seedling with a better work ethic. 6 At which point I will have to switch from finding orange exciting, and red or pink boring, to finding red or pink exciting, and orange boring.